St Patrick's Day is a day of Irish celebrations in Australia. 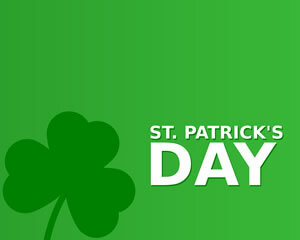 This day on the 17th March is also called St. Paddy's Day or Paddy's Day or Saint Pats. With celebrating parties at all the Irish hotels, pubs and restaurants in Melbourne, Sydney, Adelaide & elsewhere around Australia. When heading off in the morning make sure you wear a little bit of green! And whether it's a green Irish breakfast or a Guinness pie at lunch time and a few lagers after work, it's important to celebrate this great Irish day. Maybe you can organise a work group or group of friends for an Irish breakfast or lunch. To be sure to be sure. Maybe you can convince your work colleagues to go for an Irish Jig after work at a venue where an Irish band is playing! Or when you get home take the family to look for a four leaf clover in the local park! So c'mon on March Seventeen and join the party fun and celebrate in Green. Paddy's day in Melbourne will be alive with fun and plenty of green thru the city venues. Some of the fabulous places with Irish events are P.J. O'Brien's at Southbank, Hopscotch along the Yarra River and the famous Young and Jackson hotel. See what's on in Melbourne for St Pats Day. Sydney is a wonderful city to celebrate St Pats day in. 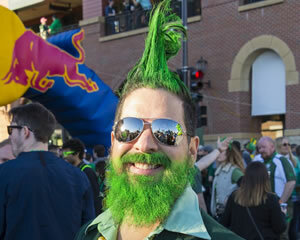 With so many restaurants and hotels and bars that will draped in Green and with Irish tunes. 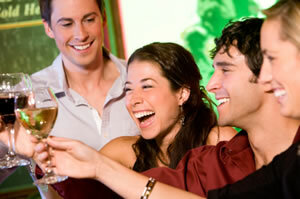 Or maybe organise your own event and get aboard a boat thru Sydney Harbour Escapes. To be sure on St Pats day in Sydney events. 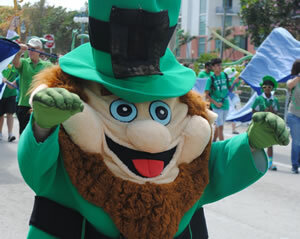 Perth people love Paddy's Day and enjoy getting involved in the spirit of Irish fun and celebration. With venues like The Aviary, the Moon and Sixpence and The Boheme all getting into the green groove. Jig along this St Patrick's day in Perth. Make sure you checkout all the great Irish St Pats parties and events all over Australian cities like Brisbane, Hobart, Darwin, Canberra and Adelaide. What are the St Patrick's Day celebrations about? While not a national holiday in Australia, St Paddy's is celebrated at Irish pubs across Australia in typical Aussie fashion: costumes and beer - and of course the infamous breakfast in a glass (Guinness). Uni students and office workers alike put any obligations on hold to head to their local pub to celebrate during a typically warm time of year in Australia.